If you've established your writing business properly by writing a business plan, why not transfer that skill to your professional repertoire and make money producing similar documents for other people? Whether it's through a business plan or a CV, practically everybody needs to market their skills at some point, and many astute business professionals choose to hire writers to help them do so successfully. Including a sample business plan and CV on your website can attract a lot of interest and provide an excellent means of making some money whilst you plan the rest of your career. Writing a business plan or a CV well requires a thorough knowledge of your subject, and in this case your subject will be your employer. It's important to develop a strong working relationship even if the whole job takes you less than a week (this kind of work can be difficult to schedule as clients often turn out not to have vital paperwork). Although you'll need to put across a solid professional image, you'll also need to engage with your client on a personal level, to persuade them to trust you and to talk openly. Clients often have a poor idea of their own marketable skills and are hazy about areas of their career history, so you'll need to be able to draw the relevant information out of them and carefully assess what ought to be prioritised. 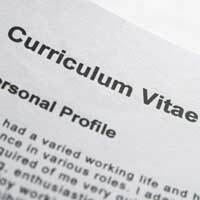 Putting together someone else's CV requires a thorough understanding of their career history, qualifications and personal characteristics. Having old CVs to work from can be helpful, but you should also talk through different possibilities with them, especially as far as skills are concerned, because there may be things which they haven't considered. Bear in mind that other people's career paths may differ significantly from your own, and don't try to squeeze them into the same template. Over time, you should be able to develop several standard CV templates suited to dealing with different types of career. This will save you valuable time, but should never distract you from engaging with your client as an individual. There are aspects of CV creation which you as a writer can't control, such as the provision of supporting documents and the quality of the accompanying photograph. However, you can guarantee that if the CV fails to get positive attention, you'll be blamed. For this reason you should consider the provision of useful advice on these other aspects to be a basic part of your job. Using sample business plan templates is much simpler than using templates for CVs, which makes it easier to promote your business plan writing services via your website. You'll frequently see adverts from people seeking business plan writers in writing jobs forums. Most of these people will have only a rough idea of what a business plan is, and will simply have been told that they need one in order to progress with their ambitions. You'll therefore need to take on the role of organiser, explaining what documentation they need to put together and, in some cases, talking them through the basics of starting a business. As a business plan writer you may be asked to help draft basic financial documents such as predicted income / expenditure charts. It's okay to do this, but you should always warn your client first if you lack financial qualifications, in order to avoid the risk of being sued later. The best way to approach the situation is usually to explain that you want the client to calculate the figures and that your job will simply be to arrange them; you should also stress the importance of the client checking over what you've done. Although you won't always be able to charge high fees for your CVs and business plans, the frequent availability of work in this area means that it can provide a lucrative source of income. Once you've got a bit of experience, you may consider agency work as an alternative to freelancing in this area. You should also aim to establish a good reputation among your clients so that they can refer friends and help you to build up your own business.